This weekend, Friday August 1 through Sunday August 3, “purchases of qualifying school supplies selling for $20 or less per item, and purchases of qualifying clothing and footwear selling for $100 or less per item will be exempt from sales tax” during Virginia’s school supply and clothing sales tax holiday. Beginning Monday August 27th, receive a FREE regular size ice at Rita’s when you donate any new school supply! Promotion runs through Friday, August 31st, and is valid at both Rita’s Midlothian locations. It’s that time of year again… School is almost back in session!! We are ready to help our area schools with your help! Bring in any NEW school supply and we will give you a FREE Regular Sized ICE!! At the end of the week, we will donate all the supplies to area schools in our community! Notebooks, Backpacks, Glue, Pens, Pencils, Scissors, Folders, Binders, Crayons, Markers, Paper- whatever the kids can use in school! Monday, August 27th thru Friday, August 31st we will be collecting donations at both Midlothian locations!! Curious about the final results from the $10 School Supply Challenge? Altogether, 10 people participated and collected a total of $933.17 worth of school supplies for the Henrico Education Foundation! The total amount of money spent for that haul was $93.79 – a 90% savings rate! The top shopper was Ann, who purchased $178.97 worth with her $10 budget. Her six-year-old daughter Natalie participated as well, and the other frugal ladies who contributed were Jennifer, Kim, Stephanie, Julie, Noelle, Eleanor, and Tiffany. Many thanks to Kroger, KidsDineFree.net, and ILikeToSave.com for providing prizes for this year’s participants! For my part, I spent $9.86 and collected $122.19 worth of supplies. It’s funny, during last year’s challenge I didn’t set foot in Staples, and this year, the majority of my haul comes from there. Altogether I made 4 Staples runs, plus one trip each to Target, Office Max, and Kroger. To get past the $5 minimum required for some of Staples cheap prices, I took advantage of the free-after-rebate items – I have submitted 5 Easy rebates for $23.98 back. I also used a couple of manufacturer’s coupons for Bic and RoseArt items. So where is all this bounty headed? Working with the Henrico Education Foundation, we’ve divided it into high school supplies destined for Henrico High School and elementary supplies for students at Donahoe Elementary. Hopefully, this inspires you about the potential of bargain shopping, particularly as a means of blessing others even if you don’t have a lot of cash to spare! Final Day for School Supply Challenge Shopping! Today – August 14 – is the final day to spend your $10 Frugal School Supply Challenge budget! I can’t wait to see everyone tomorrow at the finale event at Tuckahoe Library, and find out who shopped the savviest! We will be meeting in the big meeting room near the entrance to the right starting around 4pm. At 4:30 p.m., the prize drawing will be held from eligible entries received (You do not need to be present to win). I’ll hang around the library until 5:30 p.m. if you want to drop off supplies on your way home from work. You can even drive to the door and give me a call (email me at richmondbargains at gmail.com for my number) and I’ll come get them from you. If you aren’t able to make the event tomorrow, please email me and we’ll work out a time to meet up. Then all of fruit of your frugal shopping will be headed to Henrico High School and Donahoe Elementary School to help kids through the Henrico Education Foundation! If you wrap up your shopping this week (you have until 12pm on August 15) go here to submit your totals. This Friday through Sunday, August 3-5, 2012, will be a statewide sales tax holiday for school supplies up to $20 and clothing and footwear up to $100. While the 5% off by itself isn’t much, expect to see lots of sales and promotions in conjunction with the tax holiday! 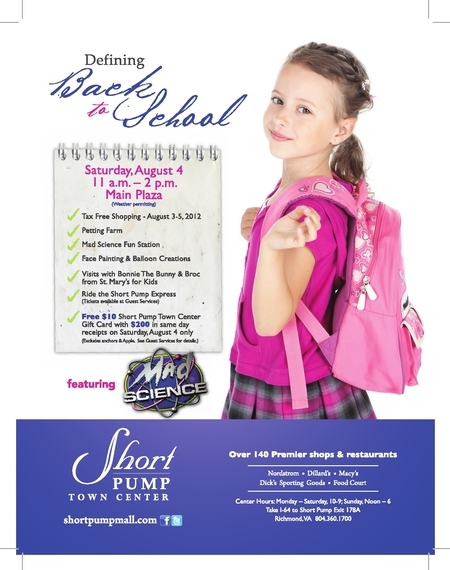 From 11am-2pm in the Main Plaza on Saturday, Short Pump Town Center will have a petting farm, Mad Science Station, face painting, and balloon creations. If you’re spending $200 or more at SPTC, stop by Guest Services with your receipts for a $10 STPC gift card. We’re entering our third week of the school supply challenge! (More info here) There’s still plenty of time to join the project. MaxPerks is Office Max’s loyalty program. You would receive the rebate to your Office Max account in September and have 90 days to spend it. If you know you’ll use that reward for other things you need at Office Max, then this would be a *great* high-value bargain to snag – backpacks are always something highly needed, and hard to get on our $10 budgets. But don’t spend the money on a backpack if the MaxPerks rewards you’ll get back aren’t useful to you! BIC mechanical pencils 0.7 mm $.25, limit 4 – Use $1 off 2 coupon from Sunday’s paper! As promised, here are some of the top school supplies deals at retailers this week! If you’ve found others (and are willing to share 😉 ), please tip us off! Staples definitely has the most potential – if you could find everything in stock and do all the rebates, I calculate you’d get over $47 worth for $4.04 spent. Update: Papermate pens $1 – use $1 Target coupon to get them free!